The primary objective of American Hydroformers is to supply high quality, tube hydroformed parts and components for automotive and non-automotive applications. 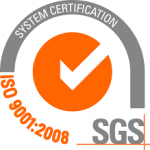 Our production system is based upon ISO 9001:2008 quality procedures. Each step of our manufacturing process is traceable through our stringent quality assurance requirements and is continually monitored through management review. American Hydroformers quality assurance objectives involve all departments and are part of the continual improvement program. With a commitment to constant examination, measurement, and analysis of our quality procedures, American Hydroformers strives to exceed customer expectations for quality from the Production Part Approval Process (PPAP) through production.